Steven Dale Crain was born on November 3, 1957 in Tulsa Oklahoma to Bobby Crain and Shirley Jean (Hale) Crain. 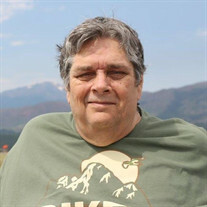 He passed from this life on Tuesday, February 5, 2019 in Tulsa, Oklahoma at the age of 61. Steven was raised and educated in Sperry, Oklahoma and graduated with the Sperry High School Class of 1976. He was married on February 14, 1986 in Sperry to Brenda Gale (Buttery) Crain. Steven spent most of his working life as a salesman for BG&S Manufacturing for about 25 years. He had been a faithful member of Destiny Life Church in Collinsville, Oklahoma for about 5 years. He enjoyed a variety of pastimes such as watching football and basketball, especially OU, fishing, and playing board games. He was preceded in death by his father, Bobby, and brother, Kevin. Visitation will be held 4:00 p.m. to 8:00 p.m. on Monday, February 11, 2019 at Mowery Funeral Service in Owasso. Memorial Service will be held 2:00 p.m. Tuesday, February 12, 2019 at Destiny Life Church in Collinsville with Pastor Jonathan Cook and Pastor Glenn Shaffer officiating. Interment will be held at Rest Haven Cemetery in Sperry, Oklahoma. In lieu of flowers the family requests that donations be made in Steven’s memory to Destiny Life Church Mission Fund, 14003 East 116th Street North, Collinsville, Oklahoma 74021. Arrangements and services were entrusted to Mowery Funeral Service of Owasso.